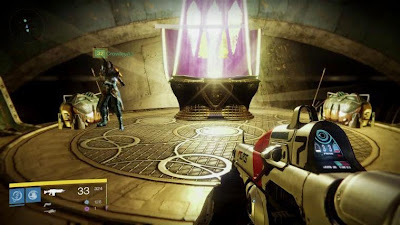 What is the Prison of Elders? In three-man team do you imagine several rounds in arenas waves of enemies. Whoever copes with all shafts and all rounds of prison-matches, may enter into the treasury of the queen of the awakened and plunder different boxes. In addition, there are weekly rewards that once give you at success. Which boxes can be opened multiple times, the rewards, there's only once a week and what is actually done with weapons and armor cores? The weekly rewards are subject to a so-called lockout - you may be able only once reap a week. This is the same mechanism that grips even with the loot in raids or during the weekly and heroic Strike. With armor and weapon cores you go shopping for items Variks. The Essential Light uses to, on light and attack power level of the DLC to improve legendary items that are not from House of Wolves. Regardless of whether you have already pocketed for the completion of a prison round the weekly reward, there is the treasure room under the prison crates to loot. The two small boxes usually contain not much more than mica and syntheses, with luck maybe strange coins and light particles. More exciting is the large chest in the center, but only with so-called treasure keys can open. The happiness you get, for example, from public events to the house of wolves, if you open the boxes with the ether, ether-Key buff. You can open the box in the treasure room in prison even if you have completed a prison match. Suppose you are playing the prison five times through, then you can open the box five times; the large chest. The only require is the treasure key. And in this big chest are very likely exotic objects contain - farm key and the prison, you can quickly get a lot of items. As in a strike the old Engrams and mica items can be dropped from defeated enemies and during the waves and rounds in prison. So look thoroughly into the arena around before you return to the airlock again and so the arena is closed.